Abstract: While this isn't quite a re-run of the the six million dollar man, the very new, and very cool Samsung 171MP is something that has caught our attention. One of the hardest aspects of reviewing technology is constantly having to sidestep previous iterations of a monitor, video card, or processor to something which is now tenfold better, and that makes your previous judgements now seem obsolete. It's also one of the best parts of this process because we are constantly being surprise by what the industrial designers are coming up with. To put it another way, "we have the technology, we can build them better, faster, stronger!" While this isn't quite a re-run of the the six million dollar man, the very new, and very cool Samsung 171MP is something that has caught our attention. In fact, before we even go one paragraph further, consider this anecdote. One of the guys in the office just got himself X-Box and brought it in to play "test". With no TV in the office, his first option was to hook it up to a Geforce 2 with TV-in. What first appears to be just a very smart looking 17" TFT LCD manages to pack in HDTV compatibility an optional TV tuner for cable Television and if that weren't enough by itself, the 171MP also sports built-in speakers, RCA video and S-Video inputs. This LCD TV quite capable in the home, office, or multimedia studio. Stereo audio via RCA input and a mini-head phone jack are also cared for if headphones are you method of choice. Oh, and did we mention that the whole display measures 2.3" thick? With convergence as the driving force behind LCD designers who are determined to differentiate their products to consumers, the 171MP comes very well equipped. With the mass of features on board the 171MP we kind of wonder why anyone would even consider another LCD display in its price range? Inputs: Component Ouput for HDTV, Analog Video, S-VHS, RCA. The Syncmaster 171MP display comes in at about 5.0kg and even has its own folding carrying handle/removeable base. 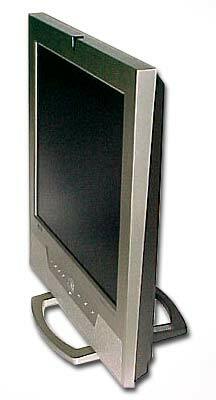 The monitor itself measures a scant 2.3" deep and has VESA mounting points on the back for an adjustable armature (100mm hole spacing). Overall the entire display measures 16.2" x 16.1" x 2.3" which gives it a nice size, although it is kind of boxy in design. All visible areas of the display are silver which makes this a rather nice monitor for presentation areas or even general multimedia office applications.